Promotes More Endurance And Allows For More Intense Focus! Caffeine is the most popular stimulant on the globe. It is a powerful stimulant to the Central Nervous System. Each capsule contains 200 mg of caffeine. Caffeine is an alkaloid; of which there are numerous compounds such as the methylxanthines, with three distinguished compounds: caffeine, theophylline, and theobromine, found in guarana, kola nuts, coffee, tea, cocoa beans, mate and other plants. These compounds have different biochemical effects, and are present in different ratios in the different plant sources. Caffeine affects the CNS causing more alertness and allowing for more intense focus. The chemical structure of caffeine is very similar to that of adenine (a component of ATP, DNA, and cyclic AMP). Only the substituents are different. This helps explain caffeine's stimulating effects. It is really close to being an energy metabolite in and of itself! Because of the structural similarities, caffeine can slip right into adenosine receptors, keeping cyclic AMP active rather than it being broken down. When cyclic AMP breaks down, the body's energy supply decreases. Because caffeine fools the body into using enzymes to break it down instead, the cyclic AMP supply remains higher for longer. I bet you always wanted to know that. Directions: For adults, take half to one tablet not more often than every 3 to 4 hours, up to a maximum of 1000 mg in 24 hours. Warnings: For occasional use only. Caffeine intake is not advisable in cases of high blood pressure or pregnancy. It is not intended as a substitute for sleep. 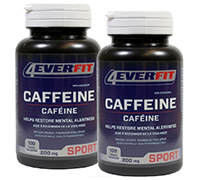 The recommended dose of this product contains about as much caffeine as a cup of coffee. Limit the amount of caffeine containing medications, beverages (coffee, tea, cola) or foods (chocolate), as too much caffeine may cause nervousness, irritability, sleeplessness, and, occasionally, rapid heart rate. Consult your physician before using this product if you are taking other medication or are under a doctors care.